Shannon received her Bachelor’s Degree in Athletic Training from the University of Vermont in the spring of 2017. While at UVM she was also an avid member of the Student Athletic Medicine Society, and competed on the Women’s Club Lacrosse team. Shannon has experience working at the division one level with UVM Women’s Ice Hockey, Swimming & Diving, Field Hockey, Track & Field, and Women’s Soccer. She worked closely with the entire Sports Medicine staff as well as the Strength & Conditioning Coaches for these teams and assisted on their training and rehabilitation sessions. She finished her clinical experience working with the Athletic Trainer at Mount Mansfield Union High School as well as local Physical Therapy clinics where she helped administer treatment with an athletic population. Growing up in Conneticuit, Shannon was a competitive gymnast for 17 years leading up to her freshman year of college. She has coached young athletes ranging from age seven to collegiate as she was the Sport Coordinator at YMCA Camp Woodstock in Connecticut. Her high energy and eagerness to assist young athletes to reach their goals plays an important part of her coaching style. She is excited to help young athletes gain confidence in themselves and their sport on and off the field. 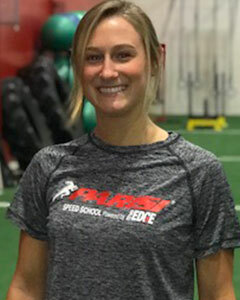 She hopes to help implement problem solving skills with the athletes at Parisi and adapt to each individuals style of learning!